Serves 4. Preparation time 10 minutes. Cooking time 30 minutes. • Fry the sausage in a pot until browned, remove from the pot and set aside. In the same pot, fry the carrots, sweet potato and onion in the sausage fat for 2 minutes. Add the water and tomatoes and cook for 10 minutes. 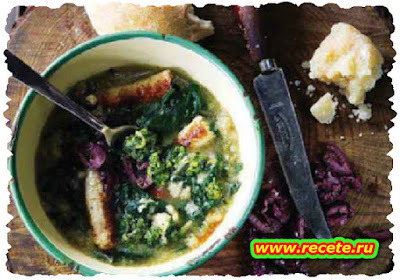 • Add the rest of the ingredients, except the pesto and olives, and bring the soup to a boil. Lower the heat, cut the sausage into chunks and return to the pot. Simmer for 10 minutes. Season to taste. • Serve each bowl with a spoonful of basil pesto and olives.